Map | Shopping link | McColls Newsagents and Post Office Roundhay Leeds Roundhay: Website | Looking for Post Office - Newsagentss in Leeds? Leeds Hotels near 61-63 Street Lane, LS8 1AP with late rooms and last minute discounts. The Postcode for 61-63 Street Lane, Roundhay is LS8 1AP, you can locate other Leeds postcodes on the UK postcode finder map. Leeds - Shopping in Leeds, Shop Leeds! McColls Newsagents and Post Office Roundhay Leeds. Leeds is THE destination for shopping in the north of England, with its impressive Victorian shopping arcades, pedestrian shopping areas, all the major high street names in the city centre, plus great shops in the suburbs and outlying areas such as this Post Office - Newsagents in Roundhay, Leeds McColls Newsagents and Post Office Roundhay. 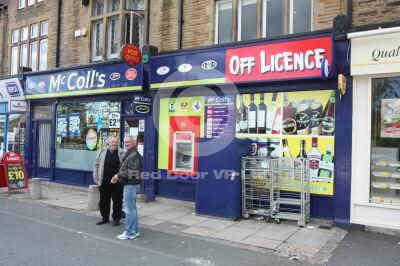 BUY PHOTO: Buy a Hi-Res digital copy of this photo of McColls Newsagents and Post Office Roundhay, Roundhay for non-exclusive commercial reproduction. (Further quantity discounts apply for orders of 3+, 5+ and 10+ different images! ).